The start of the holiday season in early November gets me feeling warm and fuzzy inside, but it also brings about an uncomfortable sensation in the pit of my stomach knowing about the plight of animals. I have wonderful memories of my childhood and young adult years spending time with family and friends, and eating lots of tasty treats. For me, it was all about the food; cookies, stuffing, mashed potatoes, chocolate, baked corn, cheese plates, and pumpkin pie. Those were a few of my favorite things to eat, and they still are, but just veganized! How do they compare taste-wise? I’d honestly say they are the same. Decadent and delicious. Is food the thing I still look forward to? Yes, it is, but it is also the thing I dread. My first two years of being vegan were extremely hard. What would I eat at Thanksgiving and Christmas? Would I go without my favorite dishes? Would I still be hungry when everyone else was in a food coma? For my first Thanksgiving as a vegan, I had a great meal with many delicious options. Some were made by me, and some by my Aunt, who hosted the meal. The hard part was (and still is) the weight of being around people I care about who turn a blind eye to the suffering of the animals they eat. 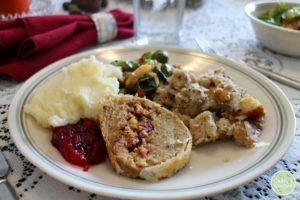 Vegan holiday meals are just as tasty and filling – yum!!! Being a “new vegan” is complicated. You are trying to figure out how to function without animal products while also fielding constant questions, hurtful and misinformed comments, and being “the vegan in the room”. Being the vegan in the room isn’t something most of us try to do. Don’t be fooled by that ridiculous joke: “how do you know when someone is vegan? Don’t worry, they’ll tell you.” This is so far from the truth. The reason most people know I’m vegan is either because one of my family members “outs” me or I have to tell them because I’m repeatedly offered food and “no thank you” isn’t cutting it. Sure, I have a magnet on my car that says “Vegan: Because the Golden Rule Applies to All Beings”. I also have shirts that say “Live Vegan, Defend the Innocent” (the Animal Advocates of SCPA shirts, of course!). Magnets and shirts are an easy way to get the message of compassion for animals into the public realm. When I’m standing in front of someone who may be drinking a milkshake or eating a hot dog, I’m not going to blurt out “Hey! I’m Vegan!”. Being around people who choose to eat animal products is hard, however, I have a better way of dealing with it than I did at the onset of my veganism. If you are uncomfortable eating with others who are consuming animal products, don’t put yourself through it. Plan activities with those you care about that do not involve food (or with vegan food!) For example, playing board games, shopping, having a cup of tea, watching a movie, and doing crafts are fun and don’t involve a meal. I was not vegan for the first 25 years of my life. I have no room to tell anyone what to eat or how to live. The only thing I can do is help others learn and grow, if they are open to it. I have been an angry vegan (at the onset of my journey), it doesn’t work, it only pushes people away. Be an example, but don’t over-do it. By living in alignment with your values and being your authentic self, you will radiate compassion and give others a shining example of a vegan. Don’t drive yourself crazy by trying to be perfect. People gravitate to those who are genuine, but it is also obvious when someone is trying way too hard. Be the true you and lead by example. If your family and friends see that you are thriving, they may just catch on! Enjoy what you love about the holidays. What did you most look forward to during the holiday season? Shopping? Baking cookies? Time spent with family? Enjoying festive lights? Focus on whatever you love about this season. Of course it can be overwhelming and stressful, take it in stride. If you just can’t handle going to your work’s holiday dinner at a restaurant, don’t go. Don’t feel pressured into situations that will make you upset or uncomfortable. If you love to cook, but are unsure about feeding your family an all-vegan meal, make a couple dishes and ask that they bring something to share, whether they bring a vegan dish or not. There is likely a vegan community near you. Reach out to them if you are in need of anything like recipes, guidance, or just someone to talk to. They may have get-togethers and social events planned around the holidays. Surrounding yourself with like-minded people makes things so much better and can ease your heart and mind. I wish you a season filled with love, peace, joy and compassion! This was absolutely perfect Adrienne, thank you! Thank you for this helpful article. Holiday meals and parties are the most difficult.